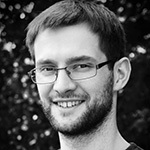 My name is Tymoteusz Bujok, I am 28 years old and a pastor for the training for the ministry in Gliwice. This christian community belongs to the Evangelical Church of the Augsburg Confession in Poland. I want to be part of the Protestant Forum because I want to talk about the role of Protestantism in the modern world. Furthermore, I am interested in meeting other young theologians from European countries and get to know about their experiences and the opinions concerning being protestant in Europe.